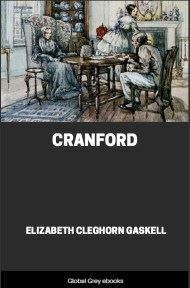 The first novel by English author Elizabeth Gaskell, published in 1848. 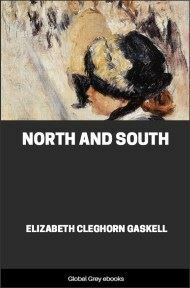 The story is set in the English city of Manchester between 1839 and 1842, and deals with the difficulties faced by the Victorian lower class. 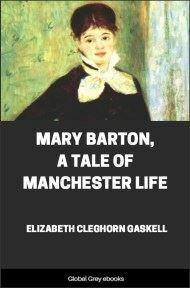 It is subtitled 'A Tale of Manchester Life'. There are some fields near Manchester, well known to the inhabitants as "Green Heys Fields," through which runs a public footpath to a little village about two miles distant. In spite of these fields being flat and low, nay, in spite of the want of wood (the great and usual recommendation of level tracts of land), there is a charm about them which strikes even the inhabitant of a mountainous district, who sees and feels the effect of contrast in these common-place but thoroughly rural fields, with the busy, bustling manufacturing town he left but half-an-hour ago. Here and there an old black and white farm-house, with its rambling outbuildings, speaks of other times and other occupations than those which now absorb the population of the neighbourhood. Here in their seasons may be seen the country business of hay-making, ploughing, &c., which are such pleasant mysteries for townspeople to watch; and here the artisan, deafened with noise of tongues and engines, may come to listen awhile to the delicious sounds of rural life: the lowing of cattle, the milk-maids' call, the clatter and cackle of poultry in the old farm-yards. You cannot wonder, then, that these fields are popular places of resort at every holiday time; and you would not wonder, if you could see, or I properly describe, the charm of one particular stile, that it should be, on such occasions, a crowded halting-place. Close by it is a deep, clear pond, reflecting in its dark green depths the shadowy trees that bend over it to exclude the sun. The only place where its banks are shelving is on the side next to a rambling farm-yard, belonging to one of those old-world, gabled, black and white houses I named above, overlooking the field through which the public footpath leads. The porch of this farm-house is covered by a rose-tree; and the little garden surrounding it is crowded with a medley of old-fashioned herbs and flowers, planted long ago, when the garden was the only druggist's shop within reach, and allowed to grow in scrambling and wild luxuriance—roses, lavender, sage, balm (for tea), rosemary, pinks and wallflowers, onions and jessamine, in most republican and indiscriminate order. 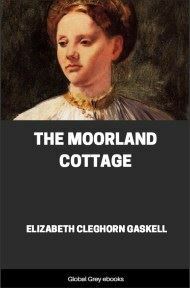 This farm-house and garden are within a hundred yards of the stile of which I spoke, leading from the large pasture field into a smaller one, divided by a hedge of hawthorn and black-thorn; and near this stile, on the further side, there runs a tale that primroses may often be found, and occasionally the blue sweet violet on the grassy hedge bank. I do not know whether it was on a holiday granted by the masters, or a holiday seized in right of Nature and her beautiful spring time by the workmen, but one afternoon (now ten or a dozen years ago) these fields were much thronged. 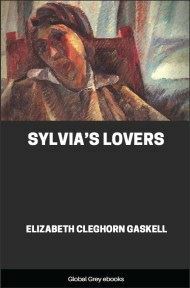 It was an early May evening—the April of the poets; for heavy showers had fallen all the morning, and the round, soft, white clouds which were blown by a west wind over the dark blue sky, were sometimes varied by one blacker and more threatening. The softness of the day tempted forth the young green leaves, which almost visibly fluttered into life; and the willows, which that morning had had only a brown reflection in the water below, were now of that tender gray-green which blends so delicately with the spring harmony of colours. Groups of merry and somewhat loud-talking girls, whose ages might range from twelve to twenty, came by with a buoyant step. 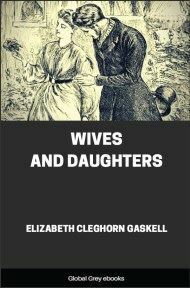 They were most of them factory girls, and wore the usual out-of-doors dress of that particular class of maidens; namely, a shawl, which at mid-day or in fine weather was allowed to be merely a shawl, but towards evening, or if the day were chilly, became a sort of Spanish mantilla or Scotch plaid, and was brought over the head and hung loosely down, or was pinned under the chin in no unpicturesque fashion. Their faces were not remarkable for beauty; indeed, they were below the average, with one or two exceptions; they had dark hair, neatly and classically arranged, dark eyes, but sallow complexions and irregular features. The only thing to strike a passer-by was an acuteness and intelligence of countenance, which has often been noticed in a manufacturing population. There were also numbers of boys, or rather young men, rambling among these fields, ready to bandy jokes with any one, and particularly ready to enter into conversation with the girls, who, however, held themselves aloof, not in a shy, but rather in an independent way, assuming an indifferent manner to the noisy wit or obstreperous compliments of the lads. Here and there came a sober quiet couple, either whispering lovers, or husband and wife, as the case might be; and if the latter, they were seldom unencumbered by an infant, carried for the most part by the father, while occasionally even three or four little toddlers had been carried or dragged thus far, in order that the whole family might enjoy the delicious May afternoon together. Sometime in the course of that afternoon, two working men met with friendly greeting at the stile so often named. One was a thorough specimen of a Manchester man; born of factory workers, and himself bred up in youth, and living in manhood, among the mills. He was below the middle size and slightly made; there was almost a stunted look about him; and his wan, colourless face gave you the idea, that in his childhood he had suffered from the scanty living consequent upon bad times and improvident habits. His features were strongly marked, though not irregular, and their expression was extreme earnestness; resolute either for good or evil; a sort of latent, stern enthusiasm.